British rock band established 1963 in London. 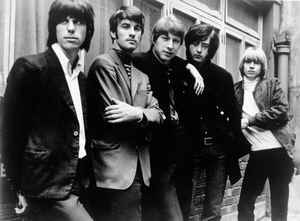 Members were Keith Relf (voc), Paul Samwell-Smith (b), Chris Dreja (g, b) and Jim McCarty (dr) with lead guitarists: Top Topham, Eric Clapton, Jeff Beck and Jimmy Page. Inducted into Rock And Roll Hall of Fame in 1992 (Performer).